The current Sommelier Journal has a great tutorial on Scotch whisky. Entitled "A Sommelier's Guide to Single-Malt Scotch," you can read it online or download a PDF. The 8-page article, nicely illustrated, covers such things as how to choose a glass, terroir, modern trends, pairings (e.g., cured pork belly with crispy polenta and tarragon paired with a peaty whisky like Laphraig or Lagavulin), and more. Check it out! You may be interested in my earlier post, Single Malt Whisky Tasting Map. This free download helps you coordinate your particular whisky taste with specific brands. It's a great tool for anyone in the early stages of single-malt appreciation, or even old hands who want to try something new. 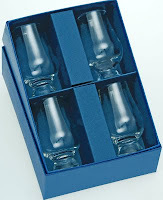 A set of 4 Glencairn Whisky Glasses : Winner of the 2006 Queen's Award for Innovation and the first glass to be endorsed by the whisky industry and members of the Scotch Whisky Association, the Glencairn offers aficionados of Scotch whisky a special vessel to appreciate its nuances. Comfortable in the hand, it has a full bowl that tapers at the rim to enhance color, body, aroma, taste, and finish. 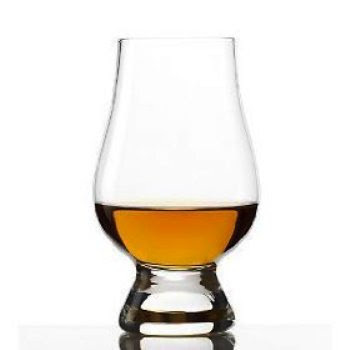 That's why the Glencairn Whisky Glass is used by every whisky producer in Scotland. Machine made from fine lead-free crystal by Glencairn Crystal in Europe. Size: 4-1/2"H, 6 oz.